When you compare the front and back of a machine made rug with a hand made rug, you can tell the difference pretty quickly; the handmade rug will be more colorful, both on the front and the back. These are a little more pricey, but the quality they offer is unmatchable! 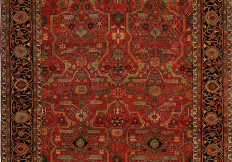 These rugs are hand knotted by some of the most skilled weavers across the eastern part of the world. Yes, they are more pricey, by the price reflects the quality and commitment that goes into weaving and designing these rugs.